I have a passion for music of all genres and am keen to share that with people of all ages.I studied piano from an early age, achieving grade 8 in practical and theory. For the past 30 years I have worked in the electronics industry and am currently looking to return to a more musical life! 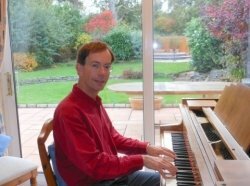 I taught piano during my sixth-form days and, after a long absence, have taken it up again - teaching to children and adults aged between 4 and 68. I believe it's important to set achievable goals for learning, be that via formal Grades (practical and/or theory) or to visualise yourself mastering a challenging piece during a future performance. My lessons follow a formal structure, but within that, there is scope for a lot of fun! DavidFrom Viviana (5/5): Dave is a brilliant tutor! Reply from: David: Demetra is an enthusiastic learner who has a passion for music. It is rewarding to see her making good progress… keep up the good work! DavidFrom Ava (5/5): My 7 year old daughter absolutely loves David’s lessons. He is able to get far more out of her because of this. He is very good and I highly recommend him. Reply from: David: Thanks for your kind words. Ava is a delight to teach and is making excellent progress. It is a pleasure to teach her. DavidFrom Melissa (5/5): I'm a mature student and new to Piano. David is an excellent, friendly teacher and very patient. I would recommend him. Reply from: David: Thanks Melissa. You've made some amazing progress and it's always rewarding to teach you.